These Leapers mounts are designed to be used with Weaver or Picitanny bases and with all scopes that have a 1 Inch tube body and an objective up to 50 mm. They are great with airguns as the Weaver base doesn't allow the rings to slip and slide. Each ring has 4 screws to hold the scope firmly in place when used on guns with even the most punishing recoil. Don't let the price fool you. They are as heavy duty and as well built as other mount available at higher prices. 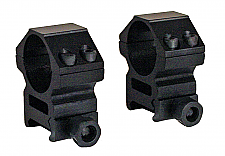 These Leapers mounts are designed to be used in conjunction with the Leapers Drooper mount base and with all scopes that have a 1 Inch tube body and an objective up to 45 mm. They are great with airguns as the Weaver base doesn't allow the rings to slip and slide. Each ring has 4 screws to hold the scope firmly in place when used on guns with even the most punishing recoil. Don't let the price fool you. They are as heavy duty and as well built as other mount available at higher prices.